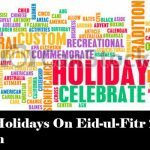 Eid-ul-Fitr 2018 Will Likely To Be On June 16 In Pakistan.Eid-ul-Fitr 2018 will be celebrated after the month of Ramadan on 1st Shawal. We enter in the third Ashra of Ramadan 1439 Hijri and everyone is wondering to know when will be the Eid-ul-Fitr 2018 in Pakistan. As per Pakistan Meteorological Department’s prediction the Eid-ul-Fitr 2018 in Pakistan will be on Saturday 16th June, because there are less chances of the Shawwal moon being sighted on 14th June in the country. The central Ruet e Hilal Committee will be held a meeting on 14th June 2018 in Karachi to see the Shawwal moon in the country. The Pakistan Meteorological Department said the climate record showed that on the 14th June weather would expect to be fair or partly cloudy in most parts of the country but the Shawwal moon won’t be visible on that evening so there are clear chances that the Eid-ul-Fitr 2018 in Pakistan will be on Saturday June 16. The Holy month of Ramadan had begun on Thursday May 17 in Pakistan, and it will last for 30 days, marking Eid-ul-Fitr on Saturday, June 16. In case, the estimation of PMD is not accurate, then Eidul Fitr 2018 might be celebrated on Friday, June 15. How To Easily Get Fresh Currency Notes On Eid-ul-Fitr 2018 In Pakistan? 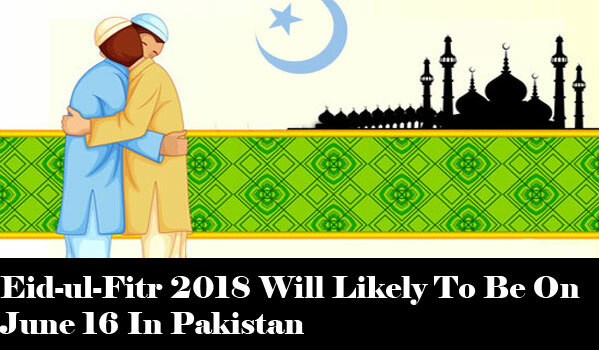 Eid-ul-Fitr 2018 Will Likely To Be On June 16 In Pakistan.Eid-ul-Fitr 2018 will be celebrated after the month of Ramadan on 1st Shawal.